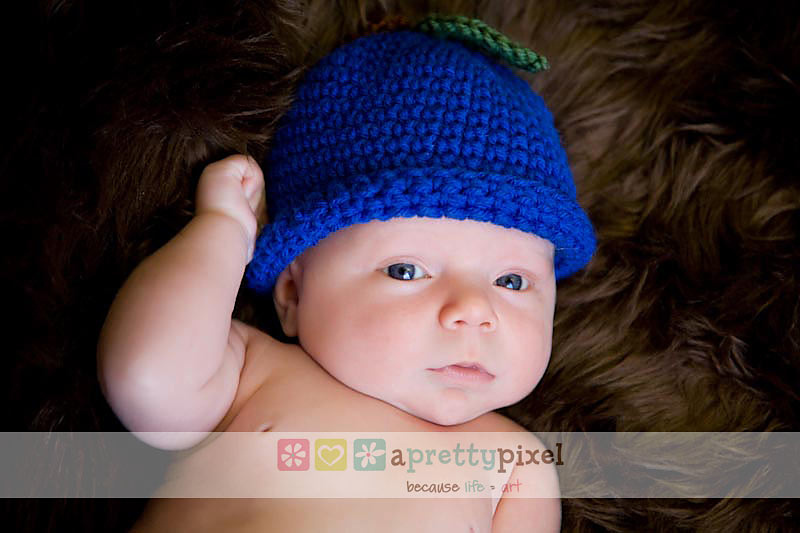 Free crochet pattern for baby hat – blueberry beanie. Quick and easy to make, worsted weight yarn, several sizes. Sizes: Newborn (3-6 months, 6-9 months, 9-12 months, 12-24 months, toddler). Head circumference: 13-14 (14-15, 15-16, 16-17, 17-18, 17½-19) inches. 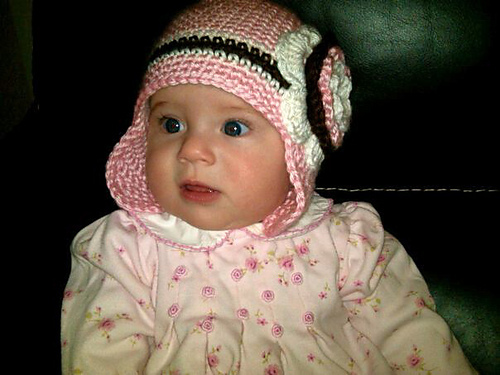 Finished measurements: Hat circumference: 12 ½ (13 ½, 14 ½, 15 ½, 16 ½, 17 1/3) inches. 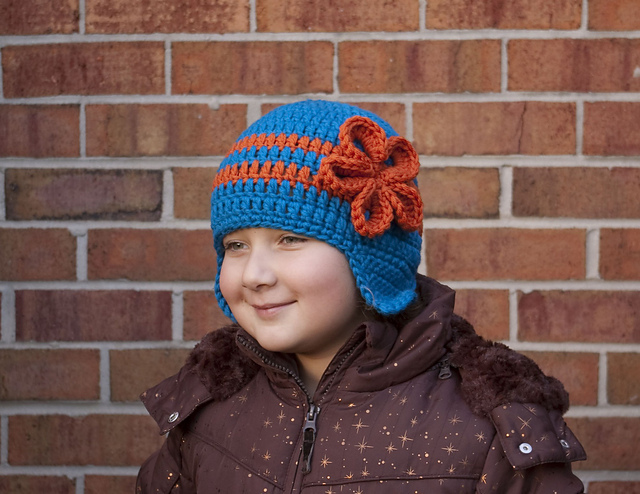 Hat length: 4 ¾ (5, 5 ½, 6, 6 ½, 7) inches. Note: Pattern is written for smaller size with changes for larger sizes in parenthesis. Yarn: Worsted weight yarn in blue, small amount in green and brown. Sample shown in: Loops & Threads Impeccable (100% acrylic; 4.5 oz [128 g]/268 yds[245 m]), 1 skein in Royal Hook: US H8/5.00 mm crochet hook, or size needed to obtain gauge. Gauge: 13 sc and 15.5 rows = 4 inches. Pattern notes: • The hat is worked in continues rounds without joining from the top of the hat down. • Use stitch marker to keep track of rounds. Place a stitch marker in a last stitch of a row. When the stitch marker is reached, remove it, work specified stitches and replace the stitch marker. Free crochet pattern for a cute toy pig amigurumi – Lil’ Miss Lilly. Quick and easy to make! This pattern was originally published in Crochet Pattern A Day 2011 Calendar. Yarn: Worsted weight yarn in pink, small amount of black for eyes and white for nostrils. Sample shown in: Lily Sugar’n Cream (100% cotton; 120 yds [109 m]/2.5 oz [70.9 g]); #0046 rose pink. Hook: US G/6 (4.25 mm), or hook necessary to obtain correct gauge. Gauge: 16 sts and 16 rows = 4″. Note on gauge: Gauge is not crucial for this project, stitches should be tight for stuffing not to show through.